Great way to provide food stores for winter; apply in late autumn. This food supplement provides carbohydrates and only a small amount of protein so bees won't be encouraged to rear brood too early. Our bees take one or two patties per hive. 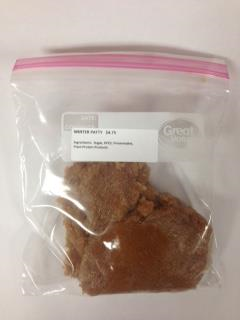 One pound packaged in a ziploc baggie for shipment and ease of storage in your freezer. Just spread onto waxed paper and lay right on top of the frames. The bees will do the rest. Made in USA.